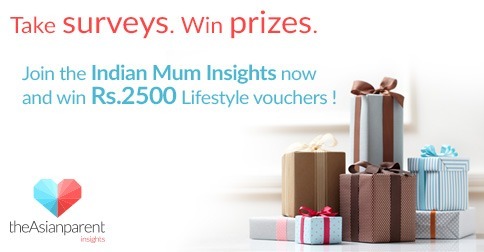 The Indian Mum Insights and the Indian Dad Insights (hereinafter collectively referred to as the "Insights Panel") is a community of parents living in India, who have the opportunity to give their opinion through surveys, influence brand strategies and receive exclusive giveaways and promotions. The Insights Panel is managed by theAsianparent Insights, a division of Tickled Media Pte Ltd, and provides insights-driven solutions and interpretive analysis based on leading-edge tools and senior-level expertise for public and private sector clients in Southeast Asia. Aside from having the chance to voice your opinion on issues that matter, you will also be rewarded for your participation. You will be entered into sweepstakes draws with chances to win exclusive prizes. The more surveys you take, the most chances you have to win. Go to our registration page. You will be asked to fill in basic information about you and your family. Once registered, we will send you surveys that match your profile. To join the Insights Panel, you must be at least 18 years of age and currently residing in India. What profile information is collected from me? Upon registration, we'll collect your contact details including name, address, email and phone number. Before becoming an official member, you will be required to provide additional demographic information on items such as gender, income, education, household composition and a few others. Profiling this information will help us ensure we have a wide range of types of panelists. How long do I remain on the panel? You will remain on the panel as long as you are an active participant and respond to survey invitations. If you do not respond to any survey invitation for 6 months, your membership will be terminated. Please see our terms and conditions for more information. You can expect to receive at least one fun sweepstakes survey per month. The surveys won't take more than 5-10 minutes to complete for a chance to win exclusive gifts and giveaways. How can I find surveys? We will always send you an invitation to any survey that matches your profile via email. I clicked on a survey link from my email invitation, but cannot connect to the survey. What should I do? I'm having trouble/technical difficulties taking a survey. What should I do? Why am I not able to complete some surveys? Some surveys look for specific types of people with specific characteristics. Other times, we've reached the maximum number of participants within a certain demographic, which helps ensure we have representative answers to the population of interest. Even if you do not qualify to continue on in a survey, we still appreciate your effort. Your participation will make you eligible to enter into our monthly sweepstakes, for a chance to win exclusive rewards. What contests do you have and when are they used? For each survey that you complete, you will be entered into our monthly draw. Click on the this link to view our incentives for the monthly prizes. We may also have contests that are specific to a survey. For these, contest details and rules will be provided within the survey invitation when you are invited to participate. Winners will be notified via email within 48 hours of a relevant draw. They will be required to acknowledge by email their receipt of notification of eligibility for prize. If no response is obtained within 7 days of notification of the relevant draw, the prize(s) will be forfeited and may be awarded to an alternate winner(s) in a random draw selected by computer from the remaining eligible entries. Prize(s) will be delivered by mail within 60 days. How is my personal privacy protected? Your email address will not be forwarded to third parties unless you give explicit permission. You will not receive spam as a result of your participation in the Insights Panel. Any personal information we collect remains completely confidential and is strictly used for research purposes only. Some of the information we collect allows us to analyze results by subgroups. To ensure your total privacy, your answers are grouped together with other members who completed the same survey and the results are only viewed in aggregate, so we never trace responses back to any single panelist. Can't find your question? Contact us via email at [email protected] We would be happy to help you! In Pics: Thomas & friends celebrate the spirit of friendship!